With a power fold, four-wheel suspension, generator and charging station, it's no wonder the 4moms Origami Stroller ($850 on Amazon.com ) has been likened to a Transformer. But this isn’t an imaginary transforming robot-vehicle, the Origami is a reality and unlike any stroller on the market. 4moms, the same brains behind the mamaRoo, developed a way to make a stroller open with just the push of a button. This feature, combined with an LCD dashboard, power generator and stroller lights, among other incredibly cool features, make the Origami perhaps the most technologically advanced stroller yet. As a mom who has struggled to fold a full-sized stroller while carrying an infant—while an uncooperative cabbie waited impatiently—I totally get it. Push a button, and the Origami neatly folds to a smaller footprint in length, height, and width. In fact, 4moms’ idea to streamline the way a stroller folds is the namesake and main feature of the Origami. As if the one-button power fold wasn't enough, the LCD dashboard and ability to charge cell phones adds to this stroller's geek factor. 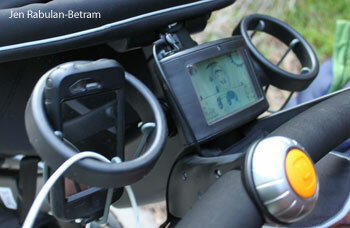 The LCD displays pertinent information, such as the time and whether or not a baby is in the stroller. If a baby is seated in the stroller, an icon is displayed on the screen, and the stroller cannot fold. 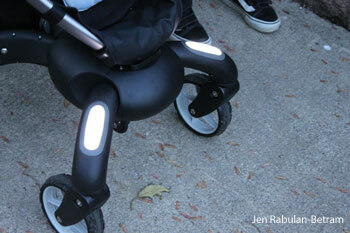 The self-generating rear wheels charge the stroller's ability to fold, charge your phone and light up that LCD. In case you don't do enough walking to charge up the stroller, rest assured, the stroller can be plugged in. The lights at the foot of the stroller are genius details. Whether it's a late night at the amusement park, stroll in the park at dusk or an evening walk to get ice cream, the lights on the Origami light the path. The Origami is a smooth ride, sleek in appearance and packed with function. As amazing as this stroller of the future is, I must admit, for the $850 price tag, I was expecting its traditional functionality to be on par with high-end full-feature strollers. Due to its design and folding feature, the basket space was understandably minimal. As a city mom turned suburban mom, that space is crucial. Many city moms need their strollers to be workhorses as they motor around the city and up and down floors, so the lack of carrying space was a feature that I missed seeing on the Origami. The overall weight of the stroller is another aspect I can't ignore. 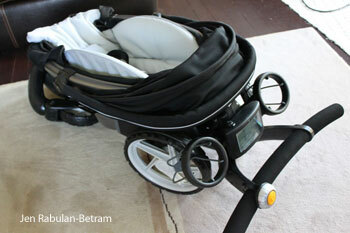 At 29 pounds, it's 9 pounds heavier than the Bugaboo Cameleon and 6 pounds heavier than the Stokke Xplory. The Origami did take up less than half the space in our spacious trunk. But this wouldn’t likely be a good choice for someone navigating cabs and trains, getting on and off public transportation with a baby in one hand and this hefty stroller in the other. 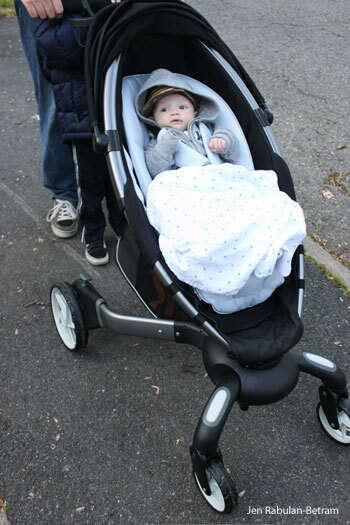 The Origami stroller has an abundance of cool features and provides a glimpse into the future of high end strollers. It's a fun luxury, and one that my husband and older son loved folding and unfolding over and over again. My favorite features on this stroller were the cell charging ability and the generator. When I find myself working with the kids in tow, the charging function can be invaluable. The rear wheels that regenerate power as you walk? Now, that's just brilliant. If you appreciate tech and don't mind making conversation over this newcomer to the stroller space, the Origami's cutting edge features and functionality is definitely for you. The Origami retails for $850 on Amazon.com. Color inserts in black, red, blue, pink and green are available for $99.99 on shop4moms.com. We checked out that stroller in person and my husband LOVED it, I also liked it and it’s really convenient. I just didn’t like how the baby can’t face you… maybe they will develop that in a future model, for now we went with the Orbit G2.